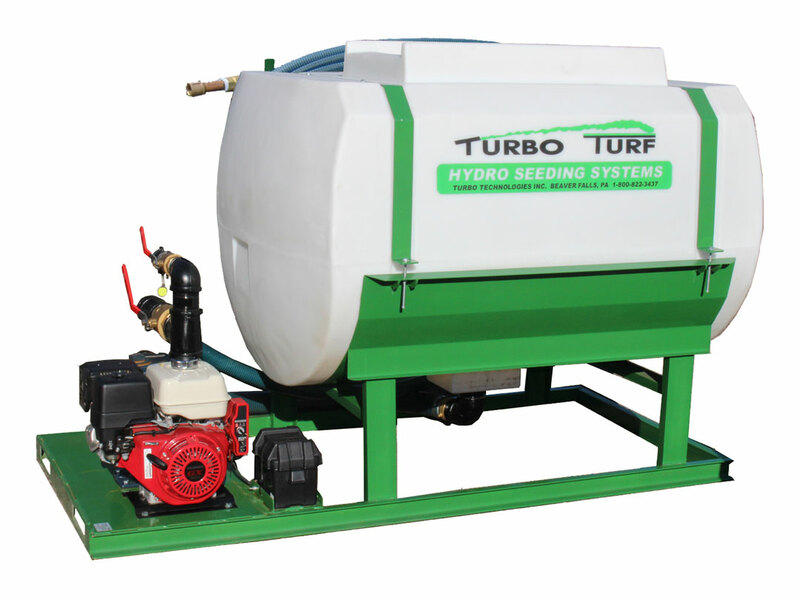 If you need faster seeding ability at an affordable price the Turbo Turf HS-500-EH hydroseeder is one of the best values in the hydro seeding industry. This unit features the same engine and high performance hydro seeding pump as the HS-300-EH but the much larger tank capacity lets you get your jobs done quicker. One person can easily operate this unit. Seeding open areas if fast. 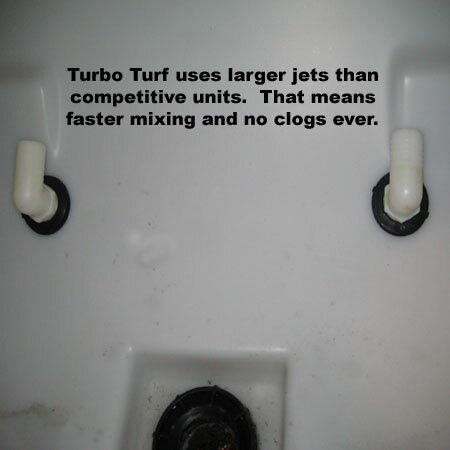 No one can match Turbo Turf’s ability to trim and work close to houses, landscape features and walkways. The HS-500-EH, is a 500 Gallon hydroseeder that will seed 6600 square feet per load. It is equipped with an 13 H. P. Honda electric start engine that is directly coupled to a 3″ X 3″, 333 G. P. M. high volume centrifugal pump. 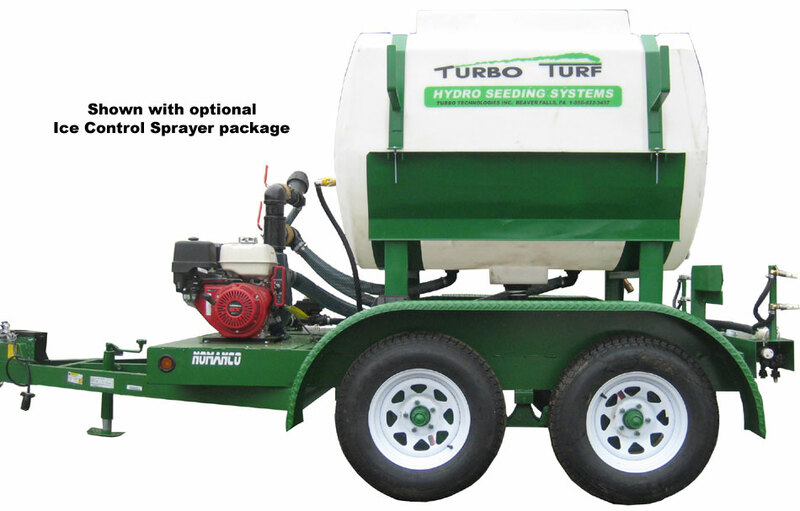 The unit comes with 100′ of 1 1/4″ discharge hose, gun and 3 nozzles ( 1 wide hydro seeding nozzle, 1 medium nozzle and one straight nozzle). The empty weight of the unit is 775 pounds. the loaded weight is 4800 pounds. the physical dimensions are 62″W x 93″L x 57″H. The size of the skid frame on this unit is 45″W x 94″L. This unit can be mounted on the back of a truck with sufficient load capacity or it can also be easily operated from a trailer. The HS-500-EH is ideal for a landscaper doing residential and commercial seeding with average jobs in the 2,000 sq. ft to one acre size. For larger jobs up to 2 acres can be seeded per day with a good water source. The fastest mixing is with a totally full load but mixing less than a full load is easy and fast. Seeding with the HS-500-EH is very quick and material is applied at approximately 50 G.P.M. Time to spray a complete tank is about 20 minutes. Mixing time is 5-10 minutes depending on material. 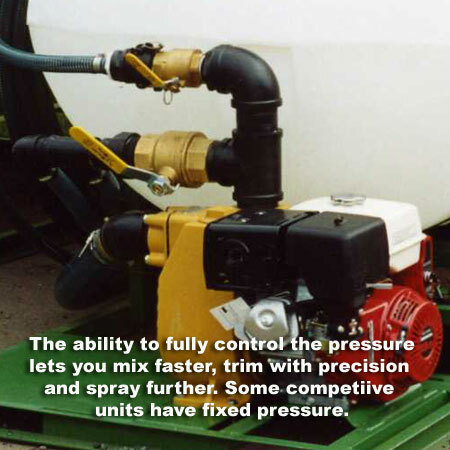 This unit comes with 100′ of discharge hose. It will easily handle an extra 100′ of hose. The spray distance with the straight nozzle is approximately 55′. 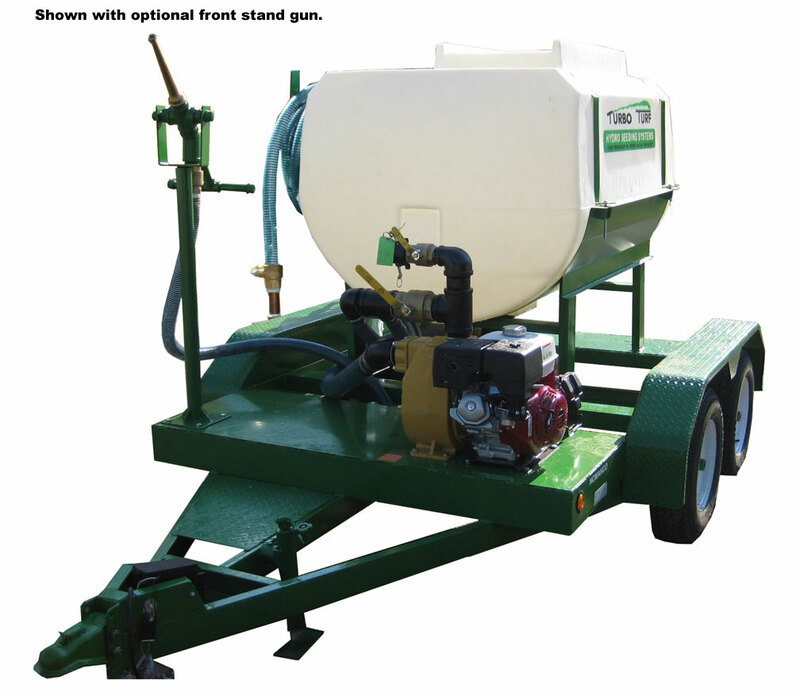 The HS-500-EH features a 3″ X 3″ 333 gallon per minute 72 P.S.I. 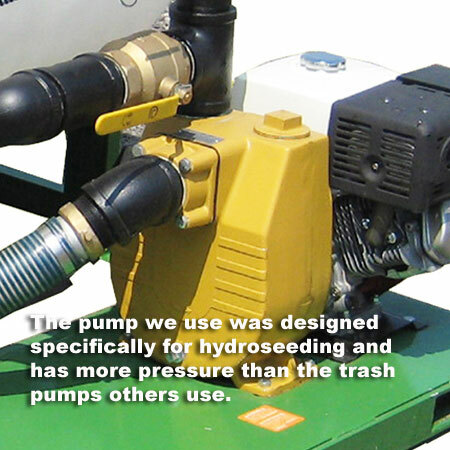 pump that was designed specifically for hydro seeding. The 2″ I.D. 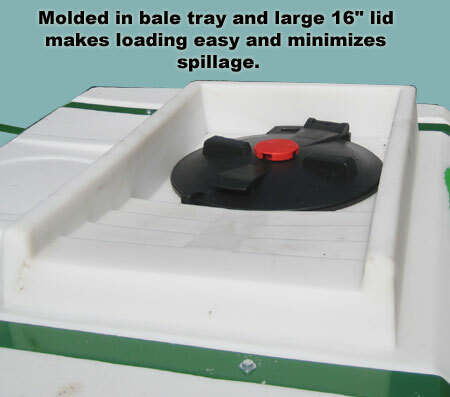 jets equipped with a quick couplers for easy service in the unlikely event of a problem, a quick disconnect for the discharge hose, and a molded in bale tray that makes loading easy and minimizes spillage. 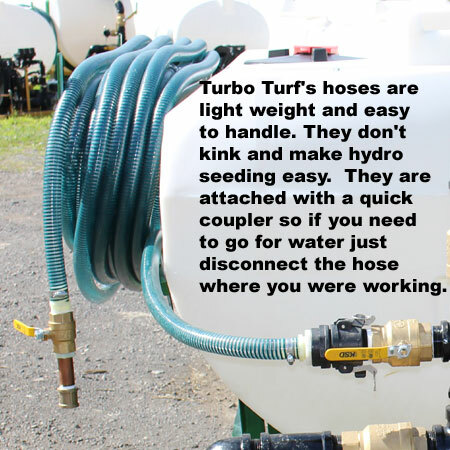 Like all TURBO TURF systems the HS-500-EH, comes equipped with a long life poly tank that can never rust, the ability to mix partial loads, a simple but powerful design with few moving parts, continuous agitation, and the ability to control the flow at the gun without making adjustments at the unit. Prices quoted are a complete machine ready to operate. The HS-500-EH-P is permanently attached to a DOT approved double axle trailer with brakes on both axles, DOT lighting, a breakaway, safety chains and an on-board test box for the breakaway battery. The trailer has a GVW of 7000 pounds and is 14’2″ long an 84″ wide. It is available with either a 2 5/16″ ball hitch or a pintle hitch.